Is Levaquin responsible for my tendon injury? I took Levaquin for a "nasty kidney infection" (the ER doc's words) in February, 2011. I took the full 10 day course, and didn't seem to have any adverse effects. I had a hysterectomy in March, so I was less active than usual for a few months, but by late May I had resumed my normal activity level. On June 25th, I attended an open air art show and walked around on concrete for 3-1/2 hours or so. I then went home and mowed my yard. No big deal...I was tired, but didn't have any significant pain in my feet or ankles. That was the last day my right ankle and foot were pain-free. Ultimately, the doctor determined that I have posterior tibialis tendonitis with secondary Achilles contracture. An MRI showed that my PTT is much thinner than it should be and slack, with a couple of small tears in it. I spent 6 weeks walking around in a CAM boot, followed by a few weeks in an ASO brace which will be replaced by a leather brace which I'll probably be wearing at least for the rest of the year, unless it's not helping, in which case I'll be having surgery. I had no idea that there was even a connection between Levaquin and tendon injury until I was talking to a friend of my mom's yesterday. She said that her son had taken Levaquin and a few months later suffered an Achilles rupture while playing volleyball, and wondered if I'd taken Levaquin. There absolutely is a connection between Levaquin and tendon damage (and a whole host of other Levaquin Side Effects. And it's important to distinguish between regular Tendonitis and Levaquin Tendonitis. an entirely different dynamic. The cytotoxic effects of Levaquin attack the cells and the tendon literally falls apart. Your situation isn't that drastic/acute. It's been a month or more since taking it. Is it Levaquin's fault? I can't say for sure. Should you ACT like it's Levaquin's fault? ABSOLUTELY. Because it's very likely that it is. You need to get on the self care to counter the side effects of Levaquin and give your body the best chance to heal. Granted, I say that to everyone. But there's GOOD reason I say that to everyone. 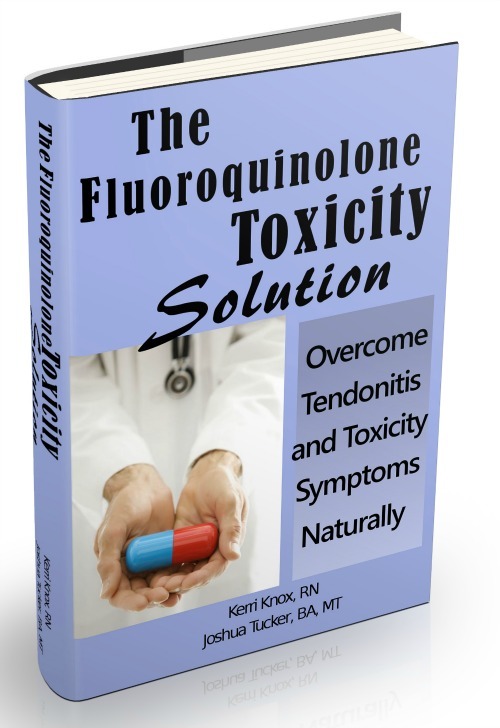 I assert that it will be worth it to get Kerri and I's The Levaquin Tendonitis Solution ebook. It gives you the explanation for all the factors involved, and a clear plan with different levels of treatment (start with the cheap stuff first). Plus there's a private forum of ebook owners, for personalized questions and answers etc. And ask any other questions.